White cop who shot black teen says he now only goes out "with like-minded individuals"
Darren Wilson was cleared by the US federal government. 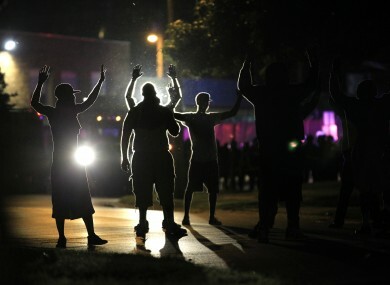 Protesters chant "Hands up, don't shoot" at police shortly after the shooting of Michael Brown. THE WHITE FORMER Ferguson, Missouri police officer who shot dead an 18-year-old unarmed black teenager has given his first published comments since the controversial shooting that reignited a discussion about race in America. Twenty-nine-year-old Darren Wilson spoke with New Yorker magazine from Saint Louis, Missouri, where he is laying low after the uproar triggered by his shooting of Michael Brown in August last. Wilson was cleared of wrongdoing by a grand jury and the federal government, but the shooting, the circumstances of which are disputed, touched a nerve in American society and ignited sometimes violent protests and heavy-handed policing in response. In the lengthy article published Monday Wilson expressed little emotion over the killing of Brown. Do I think about who he was as a person? Not really, because it doesn’t matter at this point. Do I think he had the best upbringing? No. Not at all. The article chronicled Wilson’s own sometimes difficult upbringing, his training as an officer and his work in a local Missouri police force that the US Justice Department has criticised for targeting the community’s African-American majority. But Wilson maintains that race has had little to do with his work. “Everyone is so quick to jump on race. It’s not a race issue,” he told the magazine, adding that the real issue under discussion was police power. “They’re so wrapped up in a different culture than — what I’m trying to say is, the right culture, the better one to pick from,” Wilson said about policing a black community. He said that he still eats out, but only at certain restaurants. We try to go somewhere—how do I say this correctly?—with like-minded individuals. A string of police killings of black suspects since the shooting in Ferguson has caused an outpouring of anger at perceived police racism and prompted calls for change. Email “White cop who shot black teen says he now only goes out "with like-minded individuals"”. Feedback on “White cop who shot black teen says he now only goes out "with like-minded individuals"”.